Staying up-to-date with current vaccines and regular check-ups are a very important part of a healthy lifestyle. The medical field is such an important and growing industry! We recently caught up with a doctor and her patient receiving a yearly flu vaccine at a local clinic. 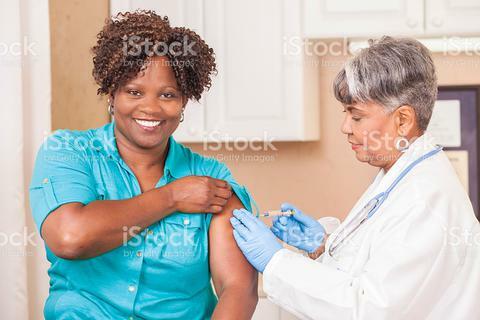 The patient happily receives her shot knowing she is now protected from the dreaded flu! Thanks to our models for helping us portray this integral part of the healthcare industry! To view more images from this shoot as well as all of our HEALTHCARE photos, click the link below. For images from this specific shoot, sort images by "newest".